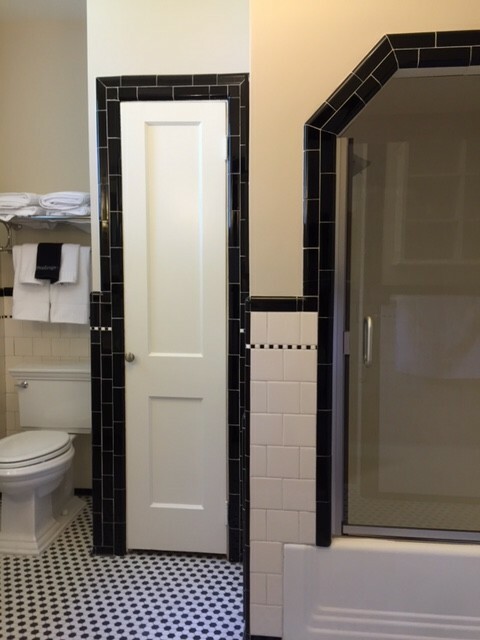 As promised, here’s the before and afters of the guest rooms of this charming new inn. 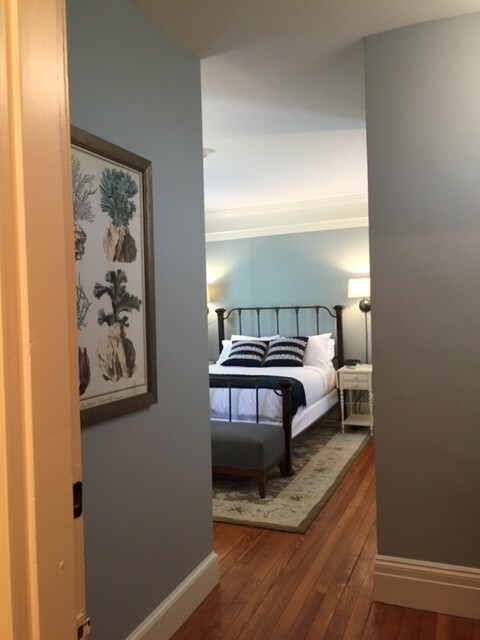 Each door on the guest-room level is painted Benjamin Moore’s Graphite 1603 in semi-gloss. The color shows brownish in this photo, but it’s actually a perfect near-black. The discreet table at the back of the hall contains coffee and tea necessities. A welcome touch. Walls are Benjamin Moore Hepplewhite Ivory HC-36 in eggshell. 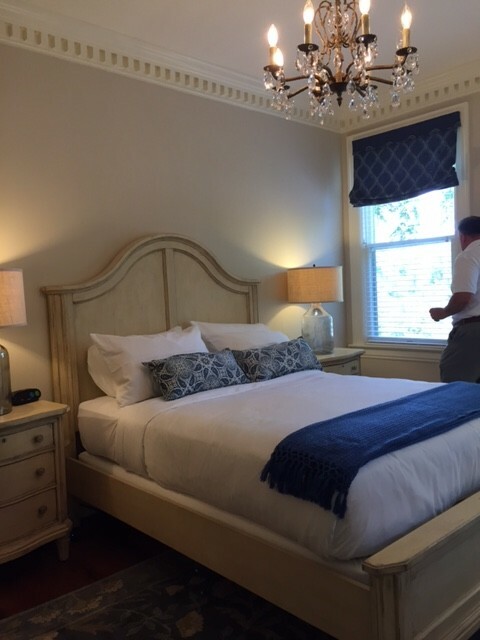 The trim is Benjamin Moore Linen White 912 in semi-gloss. 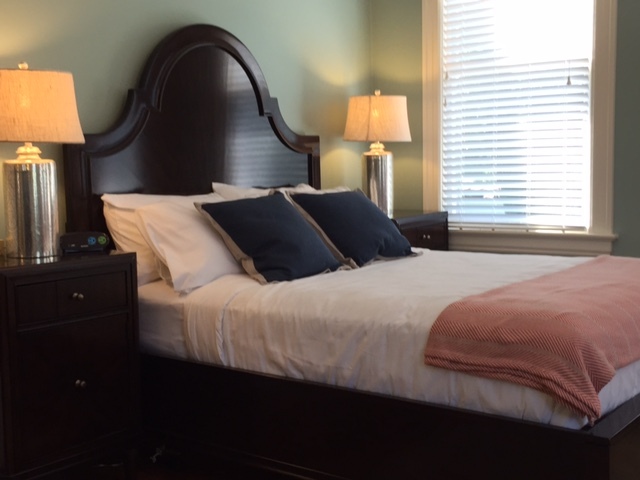 The guest rooms are soothing, light-filled and comfortable. 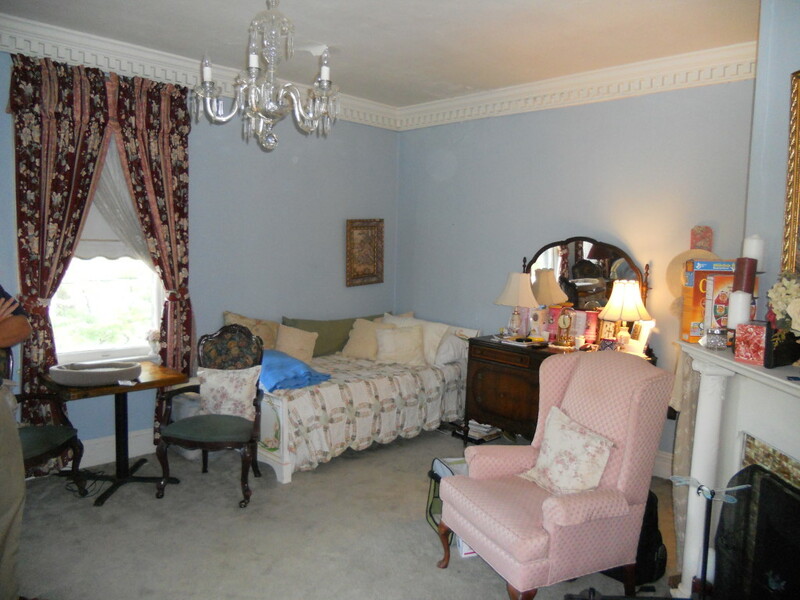 This comfortable seating area is located where the bed used to be. 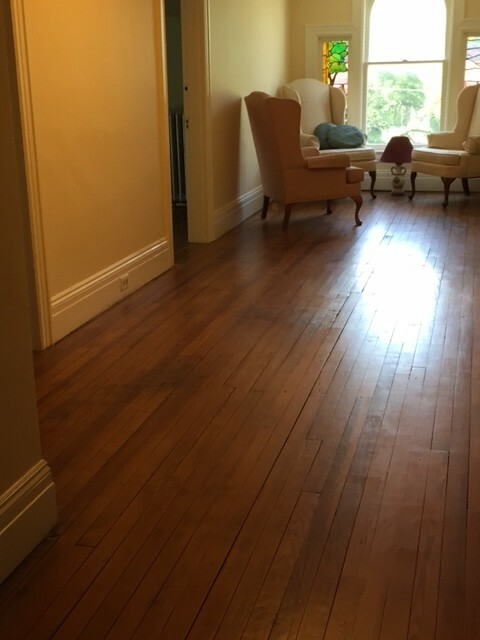 Check out how rich the freshly done, uncarpeted floors are. On this level privacy is key, so the translucent blinds are a practical addition. 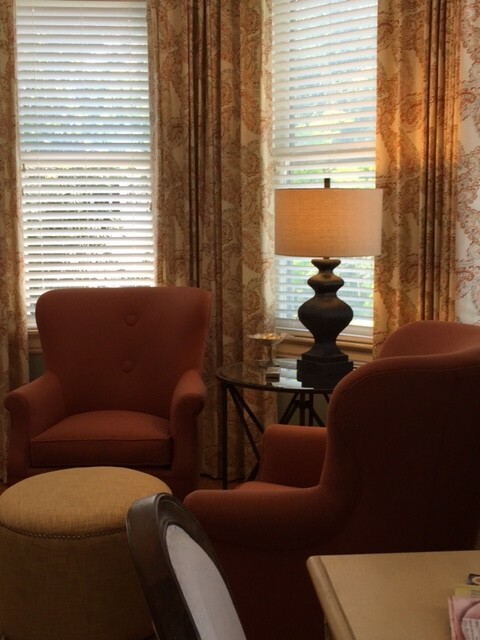 The streamlined curtains are hung at the very top of the walls, lifting your eye up to the crown molding detail. I love the bamboo chair in here. It lightens what could have otherwise become a heavier look. 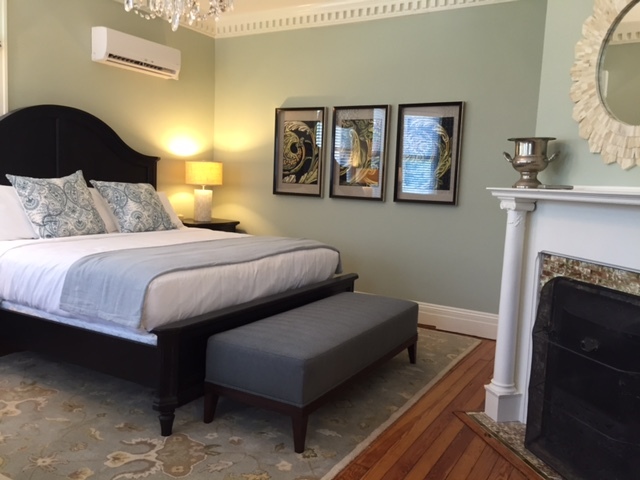 The door of this largest guest room is just to the right of the angled fireplace, allowing you to enter the room with the seating area to your left, and the bed to your right. This configuration lets you enjoy the fireplace from either location, and the special joy of being greeted by it when you enter on a cold winter’s evening. Guest room 1 is the only one with a fireplace. 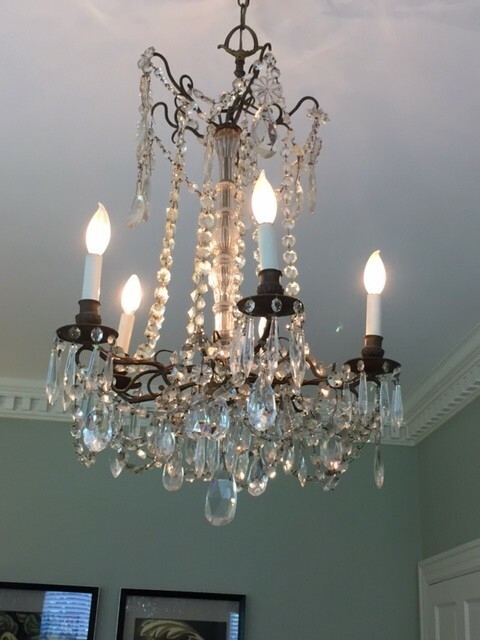 And, of course you get to enjoy this spectacular, vintage chandelier from any point in the room. 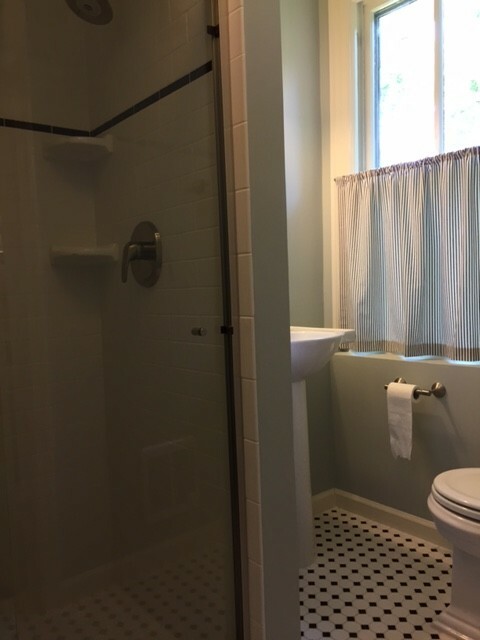 We think of bathroom renovations as such a big deal, but just look at what a difference fresh fixtures, flooring, and paint make. 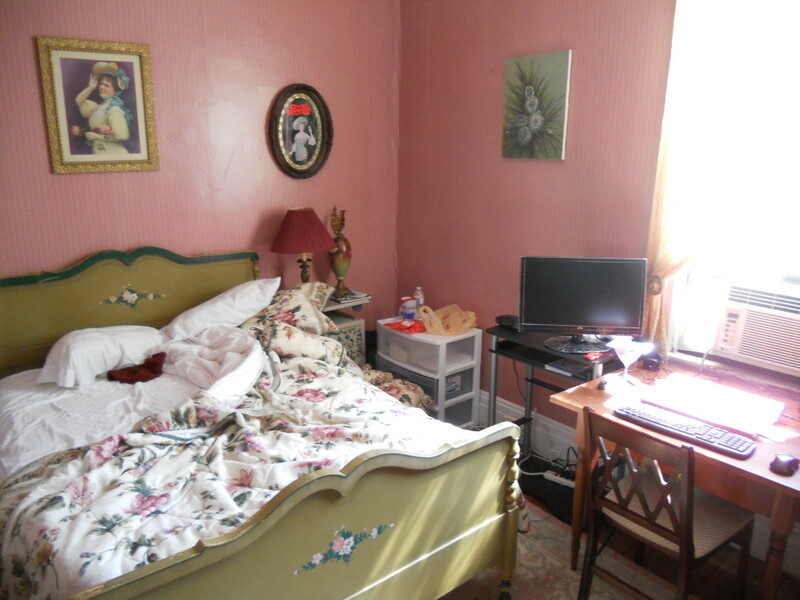 This room has retained a mildy pink hue, but now it’s soothingly pretty. Benjamin Moore’s Natural Linen 966 in eggshell. 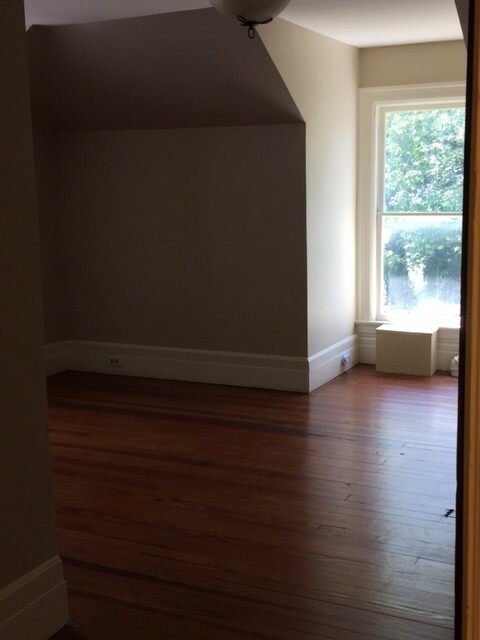 Also note the added light and space the room gets form the mirror treatment of the armoir. 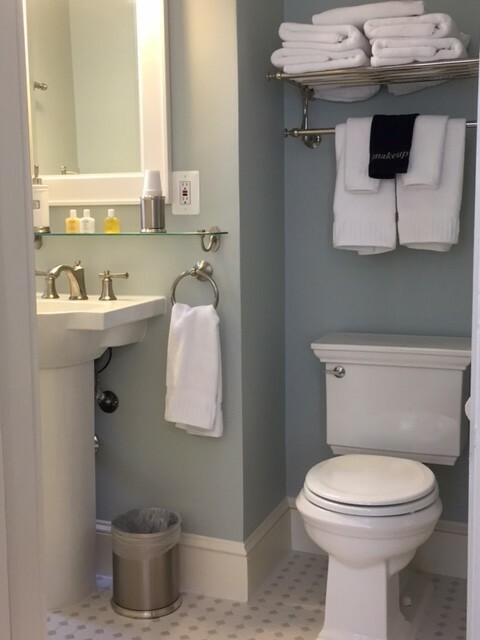 Bedroom 2’s bathroom has kept it’s fabulous vintage detailing, with freshened details like the towel rack and fresh toilet and sink. I love how the mercury-glass lamps play off the dark bedroom furniture. Walls are Benjamin Moore Catalina Blue 703 in eggshell. This front-of-the-house sitting area invites you to stay a while. I like that this room has a writing desk. A convenient touch. Bedroom 3’s bathroom. 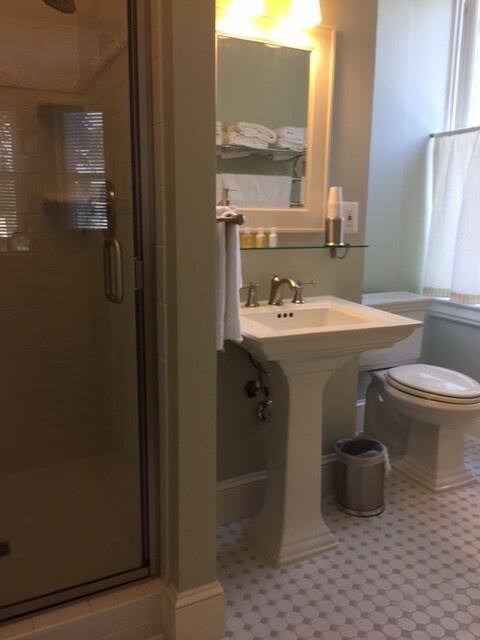 Simple and clean, just as a bathroom should be. Walls are Benjamin Moore’s Quiet Moments 1563 in bath & spa matte. 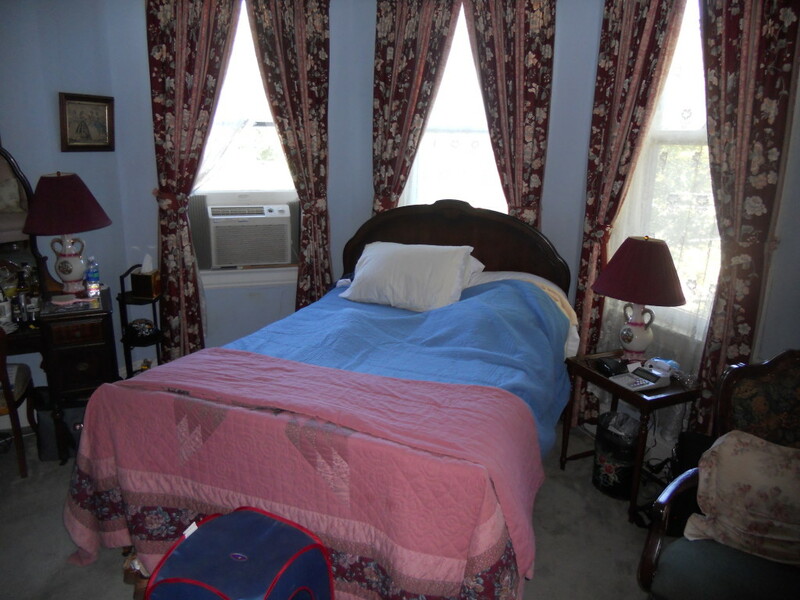 A gracious and comfortable room. The crisp blue and white color scheme is quietly done, and just right. Benjamin Moore’s Grecian Green in eggshell. 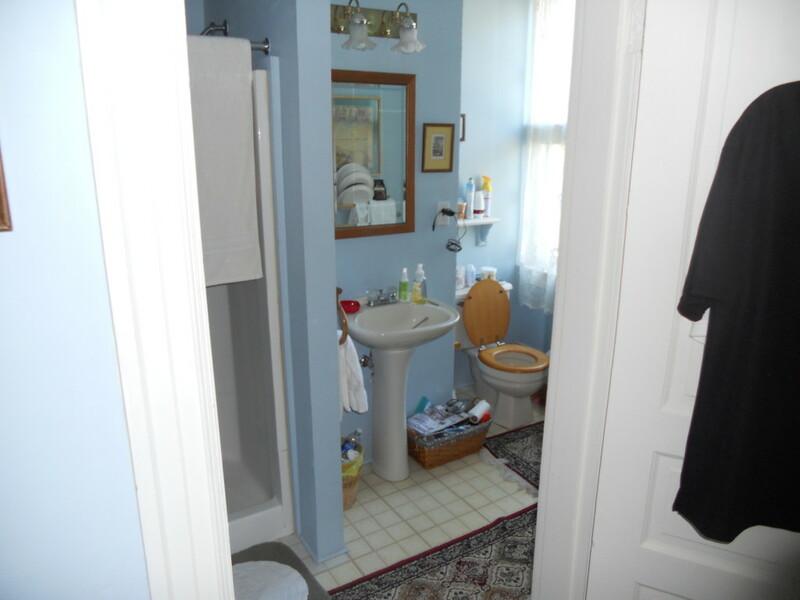 Updated with fresh toilet, sink and towel racks, the vintage character of this bathroom has been retained. 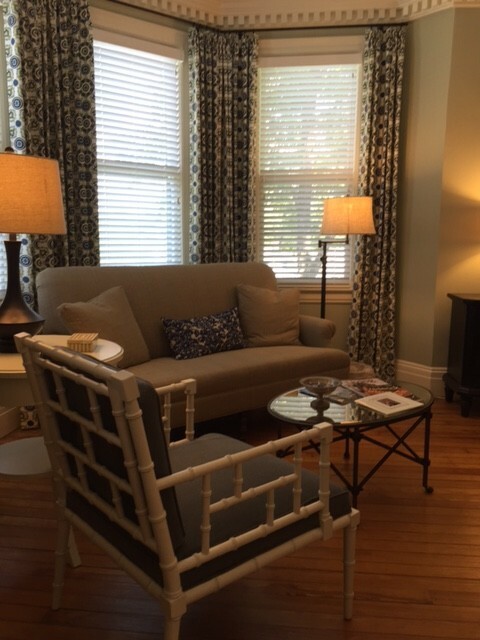 Benjamin Moore’s Elmira White. 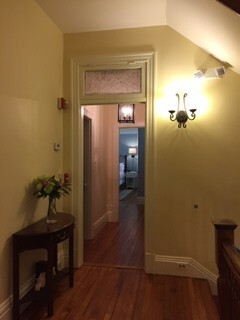 This guest room is the most private one, with its own hallway leading back to it. 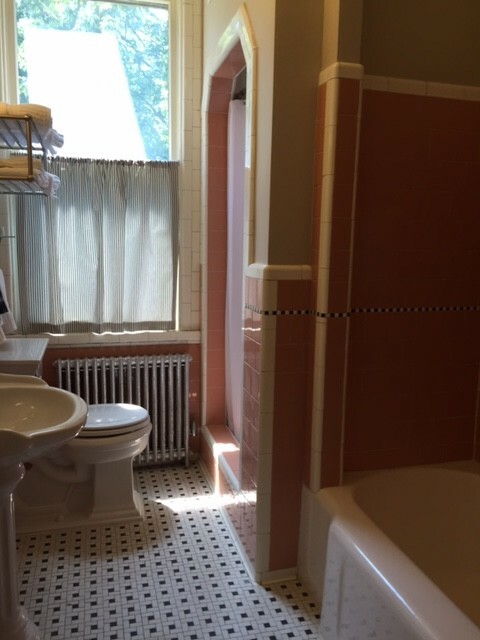 Another comfortable bathroom, painted Benjamin Moore’s Silver Sage 506 in eggshell. 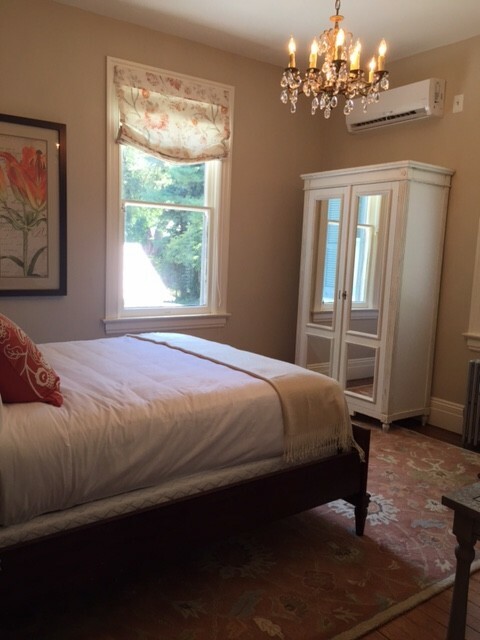 This last guest room is the most informal/cottage feel of all of them. 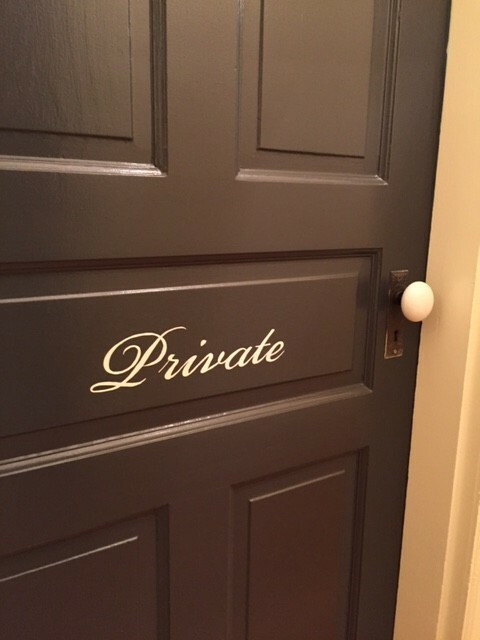 Painted Benjamin Moore’s Elmira White in eggshell. These third-floor rooms promise to be as beautiful as the lower floors, with the added charm of their dormer windows, and more intimate spaces. 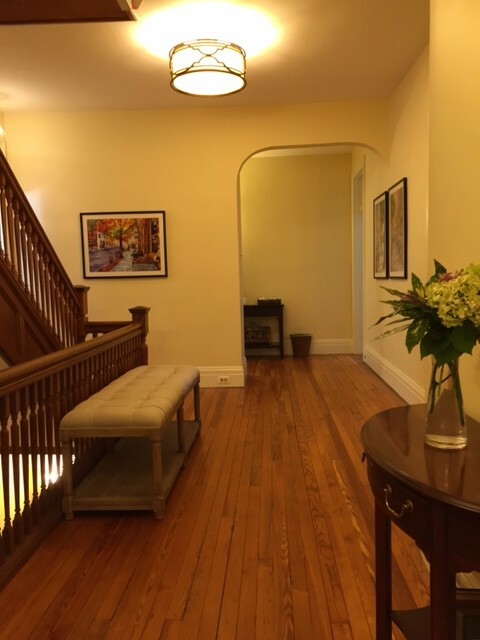 The third-floor hallway – a charming space on its own. Note the original stained-glass windows. Hope you enjoyed your virtural tour as much as I enjoyed sharing it with you! 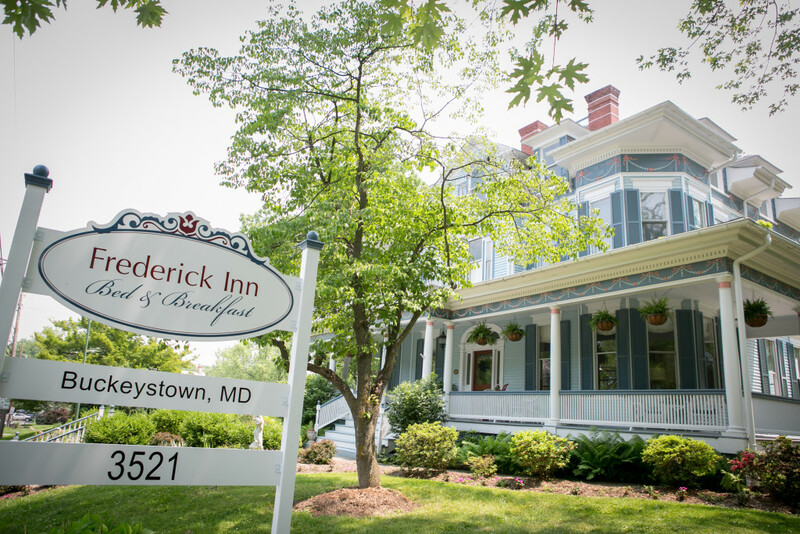 In case you missed the first post on this renovation, here’s the link: Renovation in Buckeystown.